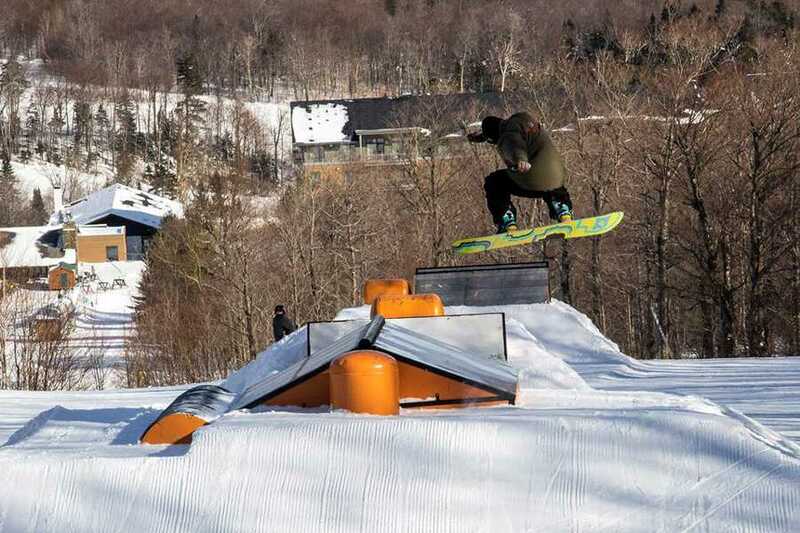 Jay Peak Resorts’ terrain parks are nearing 100 percent completion with jump lines and rail gardens to encourage progression and the creation of tricks and maneuvers for skiers and riders in the parks. As an employee at Jay Peak Resort for four seasons now, I can say the terrain parks are looking the best I have seen them in a few seasons. The whole terrain park is located on the Interstate trail, off of the Metro Quad chair on tram side at the resort. The top of the park known as the jug handle, or “JUG” consists of a small three-jump line starting with a 15 footer and ending with a 25 footer. After the jumps, you end up by a rail garden that consists of a small flat rail and box, followed by an up-flat box next to an up-flat rail. Lastly, there is a down box next to a down rail. After the rail garden you are at the start of “The Plaza”. This section brings out a lot of creativity. There is an up-tube with a barrel at the end, followed by a few more hits that also consist of several features. You will find a wall ride with a barrel and a corrugated pipe cut out too. This section ends with a long flat-box lying horizontally and set up as a tap feature next to a big telephone pole sticking straight up, with an up-flat rail next to it. This section then brings you to the bottom of the park known as the “Landing Zone” or LZ. This area consists of a serpent rail next to a long flat rail, followed by a down-kink rail next to a flat-down box. After these you can either hit a rainbow-rail or box then the last feature is a battle-ship rail. Jay Peak’s Terrain Parks Staff consists of eight workers. The park manager and lead groomer is Nick Ruschmeyer, a former Johnson State College student. He works alongside Justin Christopher, who is also a former JSC student. “We plan on adding two to three big jumps and add our bigger rail features onto Interstate and then adding features as the season goes on and trying to switch things around to keep the park fresh,” says Ruschmeyer. The Jay terrain parks have made a shift from being located on both sides of the mountain to just being located on Interstate on Tram Side. “This will allow for a unique progression and it will keep all the park skiers and riders in one area,” says Ruschmeyer. The resort will be hosting several events around the park during the latter part of the season. On Feb. 7, the terrain parks crew shaped a Skier/Boarder X course down the middle of the Interstate for one of the Northern Vermont series United Ski and Snowboard Association (USASA) events for this season. In addition to this, the Jay Parks usually hosts a NVT USASA rail jam too, but it was cancelled this season due to very cold temperatures. In addition to these events, Jay Parks will be hosting Bud Keene Progression Camps this season. “Bud Keene is a special project that we are working on now,” says Ruschmeyer. “It’s been in the works for a couple years now.” These events will be available for both skiers and snowboarders. “Bud is a world renowned coach and he is doing these camps to allow kids to get the coaching to take the sports to the next level,” says Ruschmeyer. Keene is well known for being the coach of many medal winning athletes like Shaun White, Hannah Teter, Jake Blauvelt, Kyle Clanc, and Gus Kenworthy. The two BKPRO Camps will be held at Jay Peak on February 16-17, and March 16-17. The three-day camps will be held on Feb. 24-26, and March 18-20. “We are one of five or so resorts in the world that are offering these camps,” said Ruschmeyer. As far as challenges go for this season Ruschmeyer mentioned operation times with equipment such as groomers, and getting the rest of their daily duties completed on time without conflicts occurring. The Terrain Parks Crew works a lot with the Ski School operations at the mountain too. They put up and take down the fencing in the beginner areas each day and help maintain learning terrain. The terrain park should be completed within a week or two provided that the crew gets enough time to build the final jump line along with maintain the rest of the features already up. Ruschmeyer mentioned working on updating a website that will allow skiers and riders to look at what features will be up for the day and what’s open. If you are inquiring about more information on the BKPRO Camps you can visit www.jaypeakresort.com/learn.